When I married Dave, I also married his dream of cruising the ICW. He had grown up sailing on the Chesapeake with his grandparents. I had been on a few fishing trips but had absolutely no knowledge of boats or how they operate. I love the water, though, and I was willing to learn. Before we married, Dave had owned a home in New York, and I had owned one in southern New Jersey. Our dream-OK, Dave&apos;s dream-was to keep two homes, one on the water in New Jersey, where our families live, and one in Florida, where we would stay for the winter. We would travel between them on our trawler, cruising the Intracoastal Waterway. We talked about it so much that his dream soon became mine as well. We set our plans in motion by pooling our assets and purchasing a town house in Ventnor, New Jersey, right on the ICW. How could we not? When we looked at the unit, the neighbor, Hal, came to meet us and in his big booming voice said, "Welcome to Crown Key!" It was a beautiful complex consisting of six buildings, each one containing eight homes. We shared a deck with our other neighbor, Helga, and spent many a night visiting each other&apos;s homes in our pajamas, sharing meals, and watching beautiful sunsets over the water. We bought a 21-foot runabout, and I started learning about boats. One of my first lessons came when we took our new friends out to dinner, motoring through Absecon Bay to a restaurant. It was dark after dinner, and we couldn&apos;t find the channel heading back to our house. We spent an hour floating around the back bays. Finally, we docked at the restaurant, which was now closed, and called a taxi to take us home. I thought for sure our new friends would never speak to us again, but the next morning they drove us back to the restaurant, and as we cruised back home with Hal, his wife, Kathryn, prepared a lovely breakfast. That Christmas they bought us a large spotlight. Friends like that are hard to come by, and we knew we were very fortunate. On Sept. 16, 2005, I took my camera to the school where I taught eighth grade math so I could show everyone pictures of our new granddaughter, Cara Elizabeth Doyle, who had been born the night before. Nonna and Pop Pop, as our grandchildren call us, couldn&apos;t have been happier. Between us, Dave and I have six grown children. Through the years we&apos;ve watched them graduate, get married, and have babies, lots of babies. Cara was grandchild number eight. We were so happy. We certainly never expected what happened next. Toward the end of that workday, my phone rang. I saw that it was Helga, so I cheerfully answered, "Hi, neighbor," the greeting we reserved for each other. Her voice was quiet and eerily calm as she said, "Our houses are on fire." I stood in shock for a moment before setting into motion. I ran to my car. Why did I wear heels today? I drove through the streets of downtown Atlantic City, weaving through traffic, my mind racing with thoughts about what I would run in and save. I had to get the computer. My daughter, Andrea, was getting married in just a few weeks, and I&apos;d spent countless hours preparing a PowerPoint presentation for the rehearsal dinner. All of her RSVPs were in the closet, and I needed Dave&apos;s family Bible and our photos. I called Dave as I drove. His secretary answered. I tried to sound calm when I asked for him, but she could sense the urgency in my voice and told him he had an emergency phone call. When he picked up the phone, all I could muster was, "Fire...fire...the house is on fire!" He responded the way most people would: "What?" "Fire!" I yelled. "Our house is on fire!" In a fit of panic, I drove on. When I turned the corner, I could see large plumes of thick, black smoke. Ashes fell from the sky, hitting my car. The roads were blocked off, and fire trucks were everywhere. Helicopters circled overhead, filming for the nightly news. I had to park far away, and as I ran toward our home, I called Andrea. She was at the bank, 45 minutes away, and could barely understand what I was saying due to my ranting and the fact that I was now running barefoot and stepping on briars. She said she would come right over. By then I was in view of the fire. The smell of the heavy smoke and the sight of the flames sent me into hysterics. I knew there would be nothing left to save. A fire inspector approached me and tried to calm me down. I&apos;d just had a new air conditioner installed that wasn&apos;t working properly, and I was terrified that the fire had originated in our unit. The inspector told me the fire had started in a neighbor&apos;s car on the other side of the building. It wasn&apos;t my fault. I calmed down a bit, and a neighbor handed me some water. I had to find Hal, Kathryn, and Helga. I searched through the crowd of onlookers and finally located them. Helga had gotten her dogs out, but Mac, Hal and Kathryn&apos;s cat, was still inside, and the firefighters wouldn&apos;t let Hal back into the building. I didn&apos;t know what to say. When we had moved into Crown Key, Kathryn had talked about Mac so much that I&apos;d assumed he was her son. She had no children of her own, so Mac had been like a child to her. Dave arrived and was left speechless by the sight of the blaze. Andrea and other family members rushed to the scene, and others called, having seen a special report on TV that showed our home burning down. At least we weren&apos;t alone-newscasters shoved microphones in our faces, and cameramen flashed cameras. It was the biggest fire in Ventnor&apos;s history. I could certainly think of better ways to get our 15 minutes of fame. Living on the bay proved to be tragic, as the fire could be fought only from one side. Soon, the firefighters gave up on saving our building and started pouring water on the buildings next to ours, hoping to keep the blaze from spreading to the entire complex. We watched in numbed disbelief as our entire building became engulfed in flames. I thought of my students, who at the time were collecting money for the victims of Hurricane Katrina. Now we, along with 10 other families, had lost our home. Eight of the houses that burned that day were summer homes, but three were permanent residences. The next few weeks were a blur. One of our neighbors owned a set of condos that he&apos;d been trying to sell. They were empty, and he offered them as temporary shelter to those who had lost their homes. We moved into the condo, and although it was comforting to be close to our friends, the grief was hard to take. I couldn&apos;t eat. When I did, I got sick. Dealing with insurance companies, trying to gather photos, and calling companies to obtain receipts to prove what we owned constantly reminded us of what we had lost. We took time off from work to get everything done, and my father gave me a computer so I could redo my presentation for the rehearsal dinner. I kept telling myself that things could have been much worse. If the fire had started at night, we probably would not have survived. I was still having trouble eating, so I went to our family doctor, who prescribed various medications, and to a psychologist. My lack of appetite lingered long after we had combed through the ashes and gathered 362 pages of photos and receipts. Dave and I had tickets and hotel reservations for Trawler Fest in Solomons, Maryland, the weekend after the fire. We decided to go and get away from it all. We boarded lots of trawlers and were still sticking to our original plan of saving for a few more years before buying. We figured we would have our town house rebuilt, and all would be right with the world. 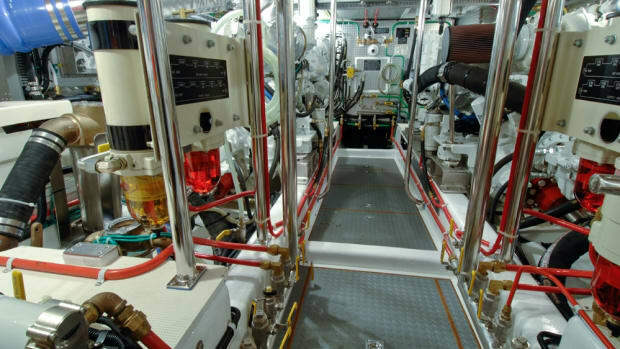 After boarding a Mainship 43, we decided our new boat would have to have two staterooms and two heads so that our future guests would have privacy. I wanted a U-shaped galley with a full-size refrigerator so I could do my thing in the kitchen and not be in anyone&apos;s way. I love to cook and entertain, and we planned on having lots of company. (Our feeling was, "If you build it, they will come.") Dave insisted on a flybridge. I think he wanted to feel like the king of the world as he cruised. We knew we were further away from fulfilling our dream than we had ever been, but something about being at Trawler Fest, talking to other boaters who were so excited about sharing their experiences, and looking at all the wonderful choices made us feel better. One evening, we dined at a restaurant called The Lighthouse Inn. It was the first meal that I&apos;d been able to hold down since the fire. Ironically, the restaurant would burn to the ground six months later. When we returned home, we rented an apartment and tried to go back to work. Dave had to drive me because every time I was alone, even for my short ride to work, I would break down in tears. Many people, even strangers, reached out to help us. We accepted any used pieces of furniture we could find. Family members gave us household items, gift cards, and money. A local restaurant offered us free breakfasts. The staff at my school took up a collection for us and never complained about the amount of work I had to miss for doctor visits and tests. Dave&apos;s coworkers took turns bringing him a healthy lunch every day until we got situated. The countless acts of generosity warmed our hearts but made us feel uncomfortable as well. We had always been the ones who gave to others; it felt awkward to be on the receiving end. Thank goodness we could talk to our neighbors, support each other, and even share a laugh about our borrowed clothes, with me in my studded jeans and Helga in her miniskirt. We discovered that our home would only be built back to the studs by the condo association because we, and several other owners, didn&apos;t have structure insurance. The association didn&apos;t even have enough insurance to build back the shell of the building and spent months in litigation to get the issue resolved. The association ended up charging everyone a very large assessment. Dave and I hung in limbo. When my weight took a huge dip, Dave really began to worry, which made me feel even worse. Finally, my psychologist said we had to do something to take control of the situation. But what? Dave had worked for the state of New Jersey for many years, and rumors began springing up that the new governor might decrease retirement benefits for state employees. That was the final sign. 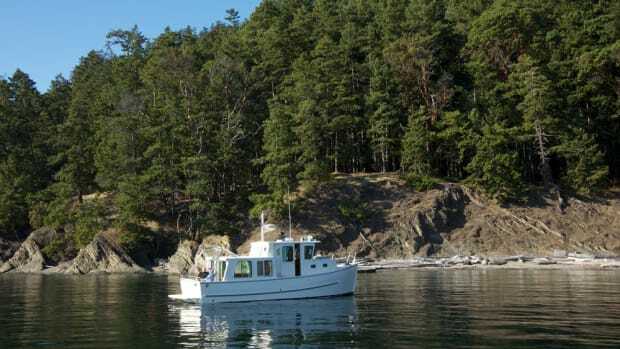 It was time to retire and move closer to our dream of buying a boat and living aboard. We would sell our Ventnor town home, whenever it was rebuilt, and live aboard the boat. Our children thought we were losing our minds, but our new plan brought us peace, and we couldn&apos;t wait to get started. First, we had to decide which boat to buy. Dave went looking on the Internet. He found a Mainship 43 that fit our budget sitting in drydock in Point Lookout, Maryland. We decided to make a weekend out of it and went to take a look. The boat was perfect. It turned out she was the same boat we had boarded at Trawler Fest, and we took this as another sign. 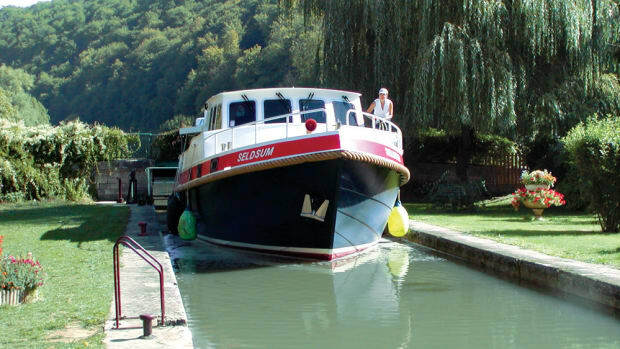 All she needed was a few minor repairs, and we would be able to decorate the boat our way. We decided to take the plunge. We spent many weekends getting her ready, and in April 2006 we put her in the water and christened her Sweetness II. During our first night aboard, at the marina in Point Lookout, a storm swept through. Dave slept soundly, but I lay wide awake. Finally, I woke Dave up, and he assured me that we were safely tied and all would be fine. The next day, the storm followed us as we embarked on our maiden voyage to New Jersey. I was a nervous wreck because of the bad weather and the fact that no one at the marina would let Dave drive the boat anywhere, not even to the fuel dock, because they knew we were new to trawlers. I think some folks were laying bets that we wouldn&apos;t make it. We spent our first night at anchor on the Choptank River in Maryland. I didn&apos;t sleep much, because I kept getting up to check that we were still moored in the little cove. The next morning, after we left the Chesapeake & Delaware Canal, our new GPS decided it didn&apos;t want to work. Luckily, Dave knows how to read paper charts better than he knows how to use new technology. By the time we arrived at our marina on the Delaware River in New Jersey, I was more than ready to get back on land. Dave had to dock the boat in the dark, and it was my first time handling lines. He docked Sweetness II like a pro on the first attempt. (I later learned that this was because no one was watching.) Most importantly, for the first time, I started to relax. We spent the next several months living on the boat on the weekends, and soon I couldn&apos;t wait for Dave&apos;s official retirement date of Aug. 1 so we could live aboard full time. We took friends and family on trips all summer. We had the grandchildren aboard to spend the night and entertained them without even leaving the dock. I was beginning to feel settled, and my appetite was coming back. Even our children started to warm up to the idea of their parents living on a boat. When we took weekend trips with family and friends, we didn&apos;t go far. We would stay at Philadelphia or Camden, about two hours away. Next, we ventured to Chesapeake City, and then to Baltimore, all the while gaining experience with docking. Dave learned that patience, and taking it slow, is the key. Sometimes he came in so slowly that I thought the dockhand would fall asleep waiting! Dave learned how to maneuver the boat when the current pushed one way or the other, and I learned a few tricks handling the lines. He never raised his voice, even as the boat drifted right when we wanted her to go left and spectators lined the marina. His philosophy was, "If I have to yell at you, it means I didn&apos;t teach you correctly." When we first moved aboard, we figured we needed a house to serve as our "home base," and we decided on Dave&apos;s daughter Nicole&apos;s. She lived a half hour away from the Riverside, New Jersey, marina where we docked the boat, with her husband, Harry, and three more of our beautiful grandchildren, Gabriella, Michaela, and Nicholas. We went there to wash clothes, and I baked cakes and used their computer. Soon I realized that I had a perfectly good washing machine on board that could magically wash and dry our clothes in a single cycle. If I did one load a day, that was plenty to keep us in clean clothes. And so what if my oven was small? I bought smaller cookie sheets, and before long I was baking up a storm. We put a grill on the aft deck rail, and soon everyone wanted to eat at our "house." Next, we bought a laptop, and the marina supplied free wi-fi. How great is it to sit on the flybridge enjoying the view and answering emails?! The process of taking short trips, adjusting to living aboard, and learning what things were handy to have on our boat was a great learning experience. I&apos;m no longer sure why we felt we needed a home base, but I guess it helped us make the transition to living aboard. By September, a year after the fire, we were ready to travel the ICW to Florida for the first time. I felt confident but a bit nervous. Our first day out, we headed toward Rock Hall, Maryland. I saw clouds in the distance but hadn&apos;t yet learned how to use the GPS weather software. I was busy with what I thought were more important details, like learning how to turn on the heat and air conditioning and operate the stove. I asked Dave if the storm was going to hit us. He assured me we would get to Rock Hall first. 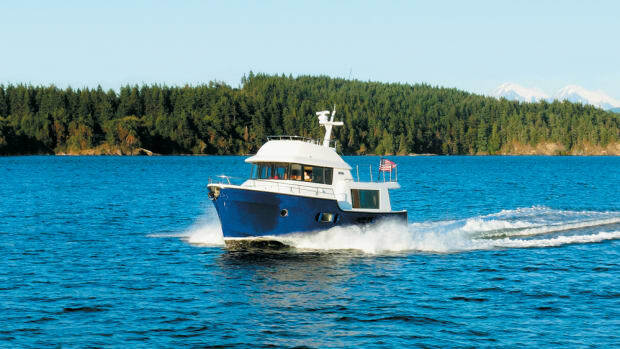 One thing we quickly learned about a trawler: you can&apos;t outrun anything. Soon, the storm was upon us. The sky turned an ugly green, rain fell in horizontal sheets, and the wind howled. Water poured in through all the zippers on the flybridge. I asked Dave if we should put on life jackets. I wasn&apos;t thrilled when he said yes. We donned the vests, and then I asked how much wind the boat could handle. Again, his answer was less than comforting: "We&apos;re about to find out." Scared doesn&apos;t begin to describe how I was feeling. "We were just passing the Sassafras River," I said. "Shouldn&apos;t we go back in it?" I gathered that Dave liked the idea, because I&apos;d never seen a boat turn around so quickly. As we entered the river, the winds subsided, and we docked at the first marina we came to, Skipjack Cove on Maryland&apos;s Eastern Shore. Dave took me out to dinner to calm me down. As we ate, the storm roared again. Still, I was glad my first day out wasn&apos;t my last. 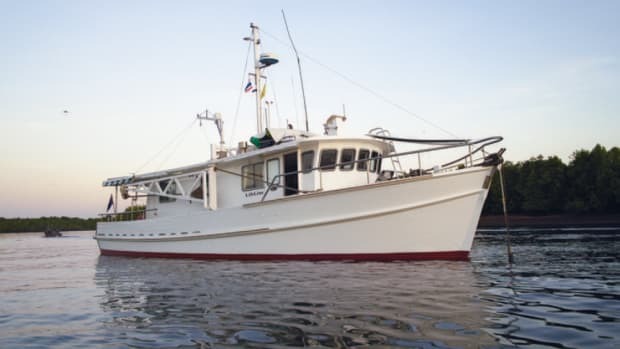 The weather was beautiful the next morning, and we cruised down to Solomons for Trawler Fest with no problems, except for the fact that we couldn&apos;t find our slip. Someone from the marina hailed us on the radio and told us we had passed it. Knowing that many who were listening were probably chuckling, it was a little embarrassing, but we managed to find our slip and tie up safely. For the next week we had a blast. Dave took the Ship&apos;s Systems Stem To Stern class, which he had tried to sign me up for, but I opted for Women Only Boat Handling. I wasn&apos;t about to learn how to change the oil if he wasn&apos;t going to learn to cook! We made new friends, and I learned how to operate the boat. Most importantly, the guy at the Garmin booth answered our questions about our GPS weather software. Dave had a bit of a headache after the Ship&apos;s Systems class, as he&apos;d learned all the things that can go wrong on board, but he also felt more confident. We took several seminars and enjoyed some great meals. I even had new curtains made for the saloon after learning at a design seminar by Compass Décor&apos;s Bridget Welton that curtains make a boat homier. (A plus for anyone planning on spending lots of time aboard, as we were.) I&apos;m certainly not an interior decorator, but attending Trawler Fest last year and looking online at so many boats gave me many ideas that I used to help make our boat our home. When Trawler Fest was over, we headed south. I was a little apprehensive, and our mechanical problems started the first night out. After we had settled in at a small marina, all the lights on the electrical panel started blinking, and a light I&apos;d never seen before flashed on. I called Capt. Dave. "What is reverse polarity?" I asked. Dave ran around shutting off all the switches on the AC/DC panel and found that one of the connecting shorepower plugs had come loose. It cost us everything that hadn&apos;t been plugged into a GFCI outlet: our microwave, both alarm clocks, and Dave&apos;s phone charger. Undaunted, we forged ahead and spent two wonderful days in Portsmouth, Virginia. (Actually three, if you count the last day, when the boat wouldn&apos;t start and we had to wait for a mechanic to come aboard to tell us a battery charger fuse had burned out.) We had two folding Dahon bicycles aboard, and we were soon enjoying riding around the different ports of call, even if people did laugh at our "midget" bikes. Whenever I saw bad weather coming, I convinced Dave to dock. Even the dockmaster at Belhaven, North Carolina, laughed at me one day when I asked Dave to make an unscheduled stop. He wasn&apos;t laughing two hours later when the storm came and he got soaked helping dock another boat. I convinced Dave to wait two days in Oriental, North Carolina, for stormy weather to clear. By the third day the weather was no better, but Dave had grown weary of waiting. He was convinced the weather was about to break, and he was ready to cruise. Needless to say, he untied the lines himself that morning as I hid in the saloon until the sun came out about two hours later. We had more fuse trouble at Coquina, South Carolina; spent two days enjoying Charleston, South Carolina; ran aground momentarily in Georgia; saw wild horses on Cumberland Sound; and then got slightly lost when the markers didn&apos;t line up with the chart while trying to find the Amelia River in Florida. We were much more seasoned cruisers by the time we reached Florida. By the way, I found out that the captain doesn&apos;t like it when he&apos;s trying to eat his lunch and the admiral is looking at eagles instead of watching the markers. Yes, Dave&apos;s the captain, and I&apos;m the admiral. Dave is so accepting of that. I wonder why?! In Florida, we had dolphins dancing in our wake and even saw an alligator and some manatees, but what I wanted most of all was to get up one morning and see a pelican perched on a piling right next to the boat. I thought it would never happen, but then we stopped at a real dive of a marina that Dave dubbed "the expensive dump." It had no facilities, not even a bathroom. The slip cost $2 a foot and was at least 15 feet too wide. With the current pushing us to one side, it was almost impossible to tie up to the other side while docking. But directly in front of our boat was an island of mangroves. Around 4 p.m. we noticed flocks of birds coming to roost for the night. It was amazing. We watched for hours as pelicans, cormorants, herons, egrets, oyster crackers, ibis, and other birds soared in and settled on a spot for the evening. The next morning, there were several pelicans so close to the boat we could almost touch them. It was a sight I&apos;ll not soon forget. I was both happy and sad to reach our final destination, Melbourne, Florida. Over the winter, we lived in our town home and took short trips on the boat in Florida, including a visit to Stuart in January for Trawler Fest and a winter cruise across Lake Okeechobee. And, of course, we made plans for our trip back up the ICW. I now realize there is nothing quite as special as living aboard. Who knows? Maybe someday we&apos;ll sell our Florida home and just do it. I think I&apos;m ready.